Delivery pizza takes forty-five minutes. Homemade can take thirty. Delivered can cost twenty bucks a pie, including the tip. Homemade, even with high quality ingredients, costs a fraction of that. 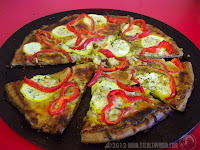 We typically have more choices for vegetable toppings than the local pizza joints. Our secrets to a great pizza crust- crispy on the bottom yet tender and soft- without kneading or long proofing, are whole wheat flour and olive oil. (If you have only white flour, see this recipe.) Pans without holes in the bottom are essential. 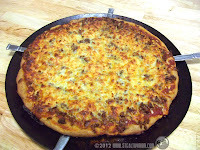 While buying big blocks of cheese and grating it myself would save money, I wait for eight-ounce bags of grated cheese to go on sale so I can pop several in the freezer for occasions like pizza. In the summer, we make tomato sauce to freeze in eight-ounce containers. Small cans of plain tomato sauce also work in a pinch, so are useful to keep on hand. 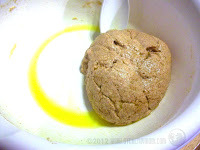 In a bowl, mix the flour, yeast, salt and sugar together. Add the warm water, stirring until the mixture becomes a ball, scraping the flour from the sides of the bowl. Pour about a tablespoon of olive oil into the bowl, and, using your mixing spoon, roll the ball around in the oil to coat. Leave the dough ball alone for three or four minutes. (Meanwhile, fetch your sauce, cheese, seasonings, and any other toppings you will use. You can do any chopping after the crust is formed and resting.) Pour about two tablespoons of oil onto the bottom of the pan. Spread it around with your hands, getting your hands coated a little as well. Put the dough ball onto the middle of the pan, pouring the extra oil from the mixing bowl with it. Flatten the dough with your hands working outward from the center. The dough will be softer than play-dough. After it is evenly flattened on the pan, if you have tears just slide the dough back together. With an oil-sprayer, spray a light coating of olive oil onto the top of the crust. (Without an oil sprayer, work a little bit of oil between your palms and gently pat it on.) That little bit of oil on top will keep the sauce from soaking into the crust. Preheat the oven to 390F. After ten minutes' rest, the crust will be ready to bake. You can top it while it is resting as long as you do not press down to flatten it. For a basic sauce, mix eight ounces plain tomato sauce with a quarter teaspoon of oregano, and half a teaspoon each of garlic and basil. Salt with a quarter-to-half a teaspoon of salt. Stir it all up and pour it over the crust. Gently spread it around using the back of a large spoon. 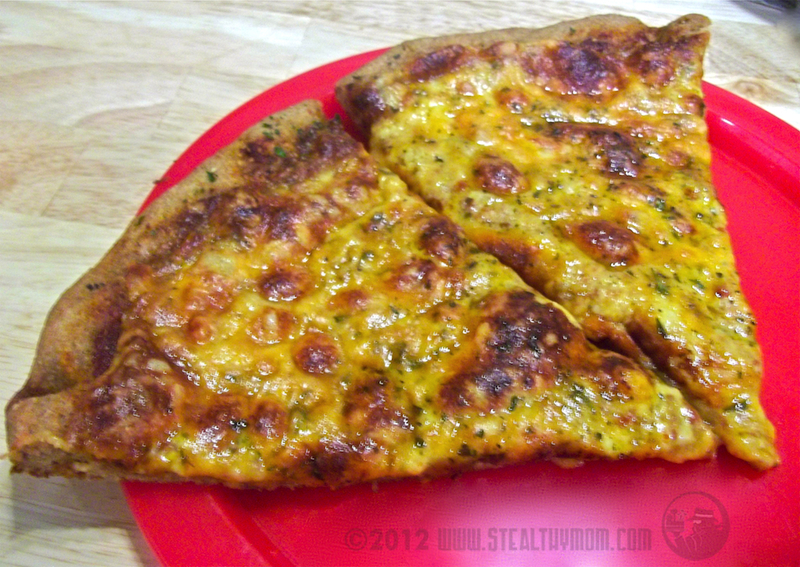 Top with eight ounces of cheese and any veggies your kids will let you get away with. Sprinkle basil, parsley and parmesan cheese on top. Bake for 14-18 minutes. It will be done with the cheese is melted and golden. As soon as you take the pizza out of the oven, slide bread knives or skewers underneath to raise the pie off the pan while steam escapes. Slice and serve. Brown a pound of grassfed beef in a pan with diced onions. For the sauce, mix eight ounces of plain tomato sauce with a tablespoon dry mustard, and half a teaspoon each of dill weed and salt. 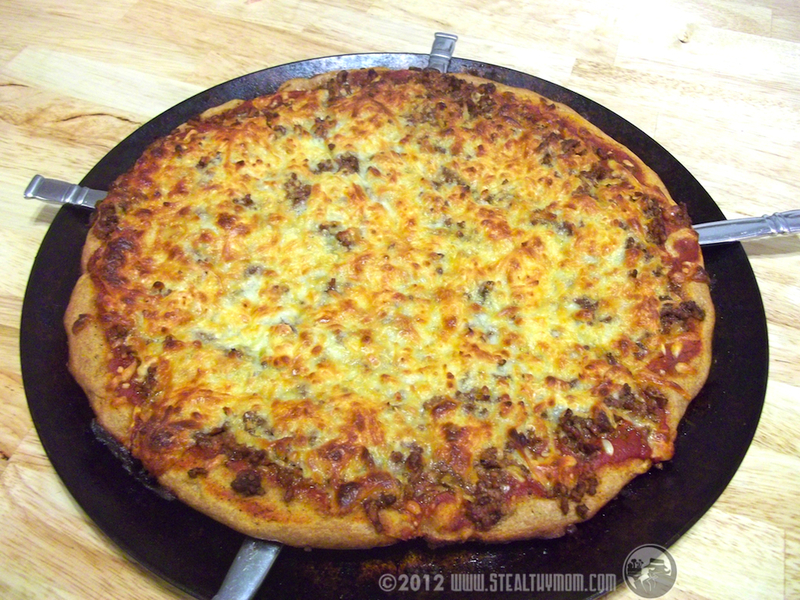 Top the crust with the sauce, browned ground beef, and half a pound of grated cheddar cheese. The local pizza joints add bacon; that is up to you. I shared this recipe with Simple Lives Thursday, Thriving on Thursdays, the HomeAcre Hop, Foodie Fridays, Fight Back Fridays, Fat Tuesday, the Hearth and Soul Blog Hop and Healthy2Day Wednesday. I love it! I hardly ever make pizza anymore,but your recipe has got my interest piqued! I'd love to have you share them on The HomeAcre Hop! It looks GREAT! Love the idea of being able to have it ready to eat so quick. Thanks for sharing at Foodie Friends Friday. Please come back and VOTE on Sunday! This looks delicious and so quick for pizza. Thanks for sharing on Foodie Friends Friday. Please come back by today and vote. Homemade can definitely be quicker than delivery, and it always tastes better. 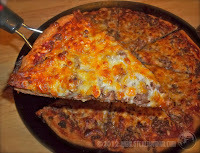 This is a great tutorial and recipe, and I like that the crust is made from whole wheat flour. Thank you for sharing this post with the Hearth and Soul hop.